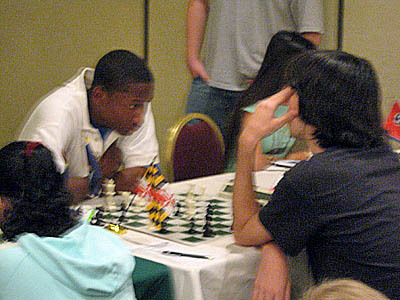 Jimmy Canty (right) at the 2007 Denker Tournament of Champions. Photo by Michael Williams. The Denker Tournament of Champions has long been the barometer for rising young stars in the U.S. The tournament features the high school champions from each of the states (including Hawaii and Alaska). Over the years, the tournament have had many prominent graduates who go onto greater things in chess. Others simply fade away and file the experience as one to tell their children. These tournaments have not had much diversity over the years, but with the huge influx of 2nd- and 3rd-generation immigrants the tournament now has a different look from the early days. Even moreso, Black teens have begun dotting the chess hall in this tournament (and the Polgar Girls). The appearances have been too far in between, but in the last three years both Kayin Barclay (Chicago's Whitney Young) and Jimmy Canty (Detroit's Cass Tech) have taken the national stage at the tournament. Both have great potential and are poised to become National Master in their teen years. With the lure of other sports vying for the attention of young teens, chess in the Black community often falls victim to dwindling interest and lack of local competition. There have been a precedent set when Walter Harris, the first Black to make U.S. National Master starred as a scholastic player in the 50s and 60s. Harris made National Master shortly after his performance in the 1959 U.S. Junior Championship where he beat Raymond Weinstein. It is ironic that Harris had a negative reaction from GM Arnold Denker. Denker was very upset at having lost to Harris in tournament game and got Hans Berliner over to the board to gang up on Harris. Unfortunately, Harris did not have his friend Bobby Fischer around! Other star players like Howard Daniels (Philadelphia Vaux), Melvin Alsberry (Chicago Carver), KK Karanja (New York Hunter) and Shearwood McClelland III (New Jersey Teaneck) all participated in various national high school tournaments, but the Denker (started in 1984) has become the most prestigious tournament for showcasing high school talent. What has happened to these players? Daniels was said to be working for a corporation in Philadelphia; Alsberry has several children and coaches chess in central Illinois; Karanja is said to be working in the U.S. south and has been seen promoting chess in Kenya; McClelland is a resident physician in Minnesota. As far as the Denker tournament, at least two players starred in the 1980s. R.O. Mitchell (Tennessee) and Kimani Stancil (Maryland) participated in the 1989. Troy Williams would succeed Stancil (both of Baltimore Polytechnic) as the Denker rep for Maryland. 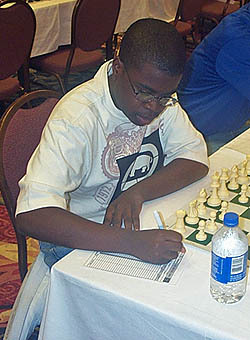 Kayin Barclay in the 2006 Denker tournament. He represented Illinois in 2005 and 2006. Photo by Daaim Shabazz. Mitchell would go on to become the U.S. Junior champion in 1990, but died tragically in 2007. Stancil, a Maryland native, excelled in academics and earned a Ph.D. in physics from M.I.T. Williams embarked on a career in computer science. It is strange the turns in which life takes an individual. One wonders how we can encourage more Black teens to seek the highest heights in chess. In seeing many of these players, the large majority of them have certainly benefited from chess and have led productive lives. One wonder what would have become of players like Ahmoad Ware (New York) and the legendary Leroy Muhammad (Missouri) if they had kept playing. Even if players never reach the level of a Maurice Ashley, chess can certainly help them shine in their lives. It is at least possible to pass on such a rewarding and enriching activity.